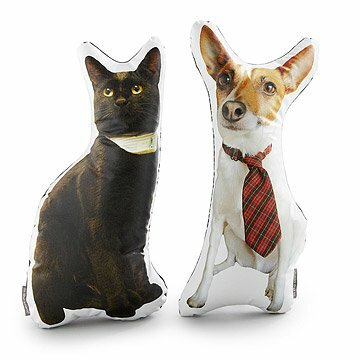 Whether it's a kitty, a canine, or a canary, honor your pet with a personalized pillow in their likeness. For all the games you've played, walks you've taken, and days you've spent in the fine company of your beloved pet, you can now honor your loyal family member —whether it's a kitty, canine, or a canary—with a personalized throw pillow in their likeness. Submit a favorite photo of your pet and Ronda J Smith will use it to create a one-of-a-kind keepsake pillow that you and your animal muse can enjoy for years to come. Handmade in Brooklyn, New York City. This is a made-to-order item. You will be required to send a photo or document to complete your order. This item typically ships 2 weeks after the artist receives the photo(s)/document(s).At this time, this item cannot be shipped to P.O. Boxes or to APO/FPO or US Territories. Contact custom@uncommongoods.com with any questions. Can't wait for my sons to open this Christmas morning!! !its an exact replica. So much fun. You can't look at this pillow without smiling. It is a Christmas gift that hasn't been delivered yet. I can't wait to see their reaction. I know they will love it!!! Great for a special surprise! I bought this for our college freshman for Christmas, who was missing her dog at school. She was so surprised and tickled she has bought it with on our holiday trip! Great gift for college kids missing their pets. My aunt loves her cat! We got her this pillow of her beloved buddy and it is a purr-fect gift!!! Everyone lives it and we will be ordering more! Fun and good quality keepsake!! Love these one of a kind pillows to rememeber our one of a kind pets!!! Awesome for any pet lover! I will be ordering more. The two I ordered were huge hits and were great quality! LOVE THEM! I purchased two of these for my college bound kids so they have a daily reminder of their sweet dog. A great graduation gift! This pillow is great! One of the best gifts ever. We bought two, one for each of our daughters who are/will be away at college, so they would have a reminder of our dog, who loves to curl up on each of their beds. Their reaction when they opened the gift was priceless: one of them shrieked with surprise and joy and the other held tightly on to hers for two solid minutes. The picture looks perfect on the pillow; it is just the right size for hugging and sitting up to greet you when you return to your room. Very precious. It's like our late cat is right here with us.